Personalized New Baby Pink Bear - 10"
An adorable Pink My First Teddy Bear like this is sure to melt everyone's heart. 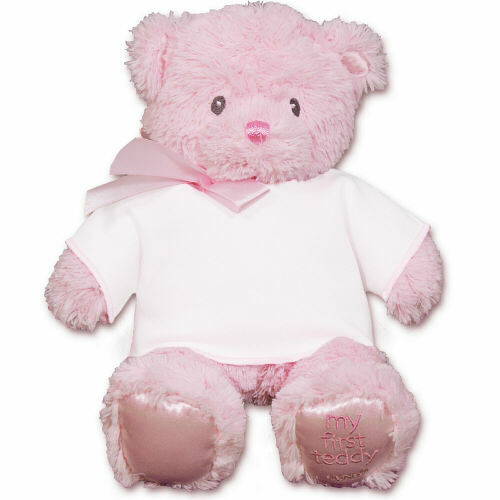 Announce your sweet baby girls arrival when you present this soft and Cully Pink Teddy Bear that is personalized just for her. This New Baby Girl Teddy Bear features short, silky fur and satin on the bottom of her feet. She also features sewn eyes instead of buttons for your Child's safety. Fully machine washable and measures about 10 inches tall. Each Pink Teddy Bear includes free Personalization! We will personalize this teddy bear’s t-shirt with three line custom message. Free Gift Wrapping and a Free Gift Card is included to create a thoughtful presentation.